Take your volleball skills to a new level by training hard with the best volleyball training equipment in San Antonio Texas. We want to help you in acheiving the volleball skill set with the proper volleyball training gear. There are many training aids to help your volleyball skills. The Volleyball Spike Trainer is a must for properly teaching the techniques of spiking. The Spike Trainer holds the ball securely in place while the attacker develops form and hitting techniques. 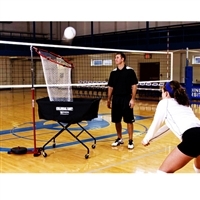 The Volleyball Spike Trainer was developed by coaches and is economical, lightweight and durable. Perfect for use at camps, clinics and practice at all levels. The volleyball training target challenger helps imporve pinpoint accuracy with your spikes and sets while the vertical challenger volleyball trainer helps build and increase your vertical jump. Having a higher vertical jump along with pinpoint accuracy developed with the volleyball training target challenger allows you to rack up points on the court.